Let’s Dino is a platform that allows people to host meals, gigs, workshops and poetry sessions in the comfort of their homes. The idea is to bring strangers together in an informal set-up so they can have a chill time together with the host. The idea is to let people eat, meet and interact in diverse, non-romantic settings. The folks at Dino want to give you options so your weekend doesn’t have to revolve around the same movie, coffee and drinks scene. You could be enjoying a music gig in someone’s living room or participating in a shaayari evening where you aren’t being judged for being too idealistic for the world… The possibilities are endless. All the proceeds from the tickets go to the hosts. Right from a Bihari meal with live music to a hands-on pottery workshop and from a farm to fork dinner at someone’s terrace to a special 5-course meal with a Rohingya refugee family literally in their modest house in Jasola slums, the community is currently hosting experiences in Delhi and Mumbai. So far, they’ve organised 70 of such diverse meet-ups. The two founders, Soumit and Sourabh, are united by their love for food and stand together on their belief that the best meals and the most heartfelt conversations don’t happen at bars but at people’s homes. They’re both engineers from BITS Pilani but came together to explore the wonders of a shared economy. “We see beauty in everyday people and Dino is there to bring out their inherent goodness and undiscovered talents. 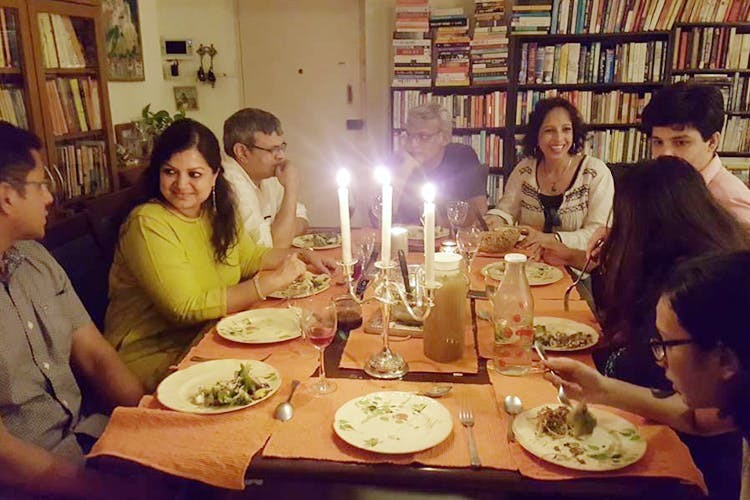 They could be great cooks or great musicians or gifted at anything at all,” Soumit explains. Dino is a small venture that wants to do small things nicely. It’s barely 8-months-old and already on its way to expanding to Bombay and Bengaluru. They also ensure that the ticket prices never go above INR 1,000 because they want to make it accessible for everyone. We honestly like this part the best. “The hosts might not have satin curtains in their drawing room but they know food like no one’s business. They have khaandani recipes that have been passed on to them and they cook them with so much heart. We actually met this Rohingya family where the woman was so passionate about food that she curated a 5-course meal that could easily put a five star spread to shame,” Soumit tells us. If we were asked, we’d say that we dig their idea of a farm-to-fork terrace dinner where people picked their own produce for an organic meal. You can see a lot of what they’ve so far hosted and even request a repeat so the Assamese meal or authentic American brekkie in your PJs can happen sooner. Drinking at CP is done to death. Music fests are far and few. Sign up for these novel experiences and meet lovely folks while you’re Dino-ing. PS: They are soon going to organise a speed dating event in a nursery. We’ll keep you posted.